The Alaskan tourism industry grew rapidly in the early 20th century. Publicity from high-profile private “expeditions” (such as the Harriman Expedition) sparked an interest in Alaska among America’s middle class. Shipping lines quickly recognized the value of Alaska as a vacation destination, bringing the curious to see strange landscapes, animals, and cultures. 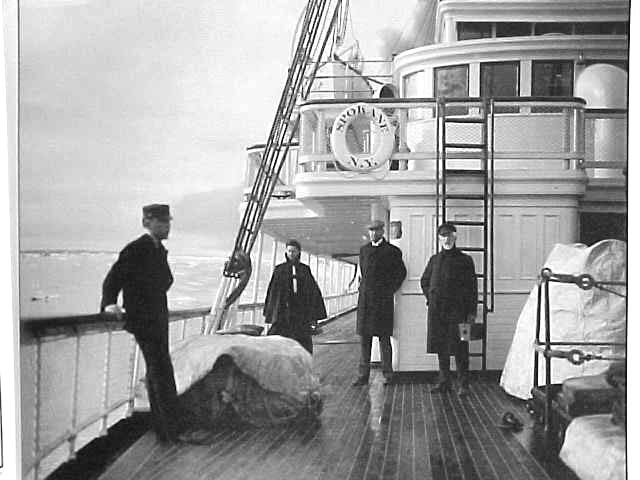 Early tourist cruises to Alaska often shared space on cargo ships or combined cargo/passenger vessels (which I’ve mentioned several times before). Even purpose-built “excursion” vessels usually had a large cargo capacity, and often made stops at industrial ports like Funter Bay during their tour circuits. Shipping lines capitalized on this by calling such stops “Surprise Ports”. 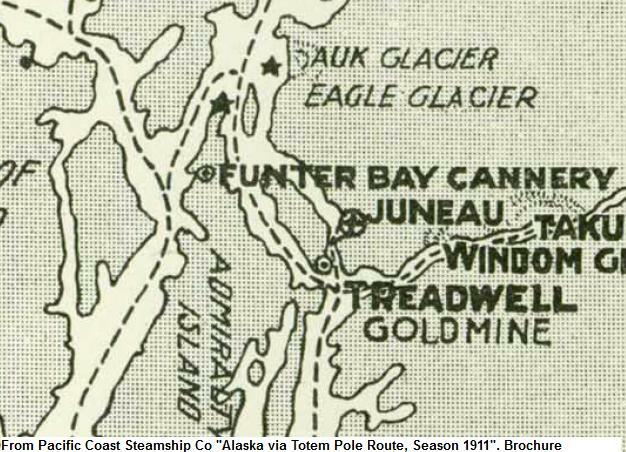 (Excerpt from “Looking Ahead to Alaska”, pamphlet of the Alaska Steamship Company, ca 1934). Of course, the downsides of such “surprise ports” were never mentioned in the advertising… the noise of cargo loaded late at night, the aroma of a fish processing plant, or the unexpected wait if the captain misjudged a tide and went aground at low water. While canneries like the Thlinket Packing Co could be an unexpected stop, at least one steamer line made a point to incorporate it into their regular routes and advertising. A 1911 brochure from the Pacific Coast Steamship Company lists Funter Bay among its regular stops and attractions. Funter Bay Cannery is a revelation to those who have not seen the workings of the packing of food fish for market. Millions of salmon annually are taken from these waters, packed in tins after most approved modern methods and take place in the food supply of the world. 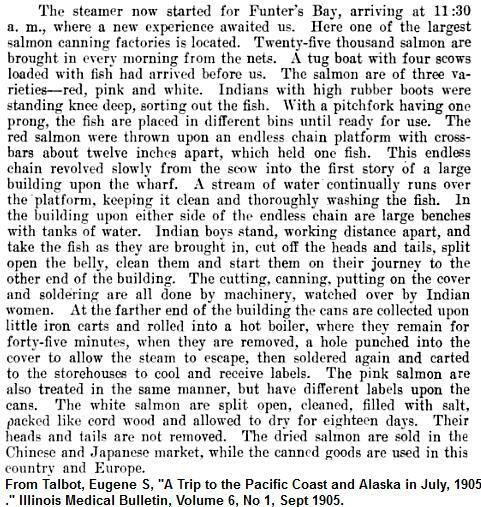 Passengers have ample opportunity to inspect the cannery or to photograph the beautifully located nearby Indian village.” (From Pacific Coast Steamship Co “Alaska via Totem Pole Route, Season 1911”). A 1909 advertisement also mentions Funter Bay as a stop for the Pacific Coast’s steamer Spokane. I’ve previously posted this photo, which was labeled as the SS Spokane at Funter Bay in 1905. I am unsure of the source. The steamship brochures also took every opportunity to push native art and trinkets, asking readers “Have You Collected Indian Carvings?” and “Is Alaska Represented in Your Den?”. Every port seems to have had a dockside market of souvenir merchants, including Funter Bay. An undated photo from the Clarence Leroy Andrews collection is described as “Natives with baskets for sale to tourists. Wharf at Funter’s Bay”. By 1914, the Pacific Coast Steamship Co seems to have dropped Funter from their tour route and replaced it with a stop at Killisnoo’s herring reduction plant. The SS Spokane continued to visit Funter on cannery business, including a 1920 trip where cannery workers and officials made up the entire passenger complement. Another trip in 1925 saw the former Spokane, now renamed the Admiral Rogers, delivering a load of mining equipment to Funter Bay.